Grangemouth is situated in Central Scotland and is one of the main towns within the central region with a population of approximately 32,000 persons and provides substantial employment for the Central Region and beyond. Grangemouth benefits from being Scotland’s largest deep sea container port with excellent road and rail connections. Grangemouth benefits from excellent transport links being served by a main line railway station in nearby Falkirk and the M9 motorway. Ineos has recently announced a £450m investment programme in their Grangemouth facility. From a local context the property is situated on the south western side of Beancross Road at Junction 5 of the M9 Motorway. The subjects form the first floor of a two storey detached modern office building. The accommodation is currently split into 2 suites each extending to 1,374ft2 and 1,714ft2. 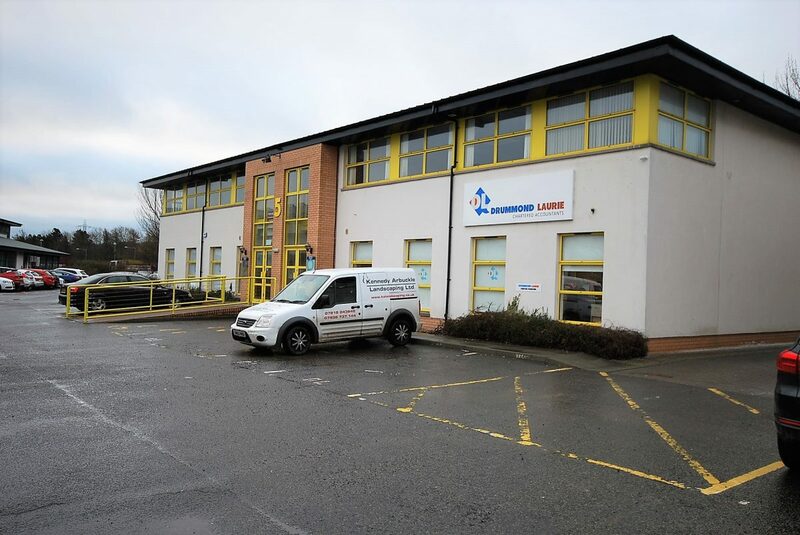 In addition to this we have another ground floor suite within the same business park extending to 4,553ft2. Internally, the suites are open plan in nature and each have a separate kitchen area and air conditioning. Common w.c facilities are provided. Externally each of the suites benefit from a good allocation of private parking. Rent from £11,000 per annum. From £8 per ft2. Each suite is banded differently and as such a copy of an EPC can be sent to interested parties.